Just because something is called a “cytotoxic T lymphocyte” doesn’t mean it’s actually, you know, cytotoxic. And just because something is called a “lytic granule” doesn’t mean it’s actually lytic. The movie below shows sort of the traditional view of CD8 cell functions. 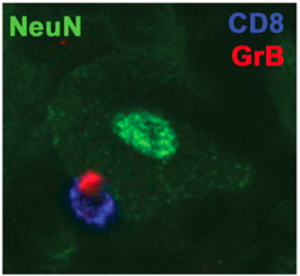 2 Here we see a CD8 T cell 9in blue) and a target cell (filled with a green dye). At about 10 minutes (the film is speeded up, don’t worry!) the T cell makes tight contact with the target. Within five minutes, the target loses its dye; this is probably because the T cell is punching holes in the target cell’s membrane, so that internal contents can leak out. This is the caused by the T cell protein “perforin”. But T cells are capable of killing their targets in several ways, and we see a second mode of killing kicking in over the next 45 minutes or so. The target cell starts to bubble up, showing dense internal structures; this is probably the target entering a programmed cell death (apoptosis) pathway, and this is caused by a number of T cell proteins, especially “granzyme B”. So, perforin and granzyme B are both killer proteins. They’re part of the “lytic granules” found in activated CD8 T cells. What Hendricks’ group has found is that perforin and granzyme B can also protect against herpes simplex infections without actually killing the target cell. Herpes simplex virus first infects the skin or mucous membranes, then rapidly jumps into the neurons that innervate that patch of tissue and track up the axons to the ganglion. For the familiar and ubiquitous herpes simplex type 1, this is usually the trigeminal ganglion. In the neuron bodies of the ganglion, the virus (supposedly! — this is the traditional view) shuts itself down, reducing its protein levels to an undetectable level, and enters a latent state, where the viral genome hangs out but it’s otherwise pretty much a passive blob. Intermittently, the virus can reactivate from latency (especially after local immunity is reduced, for example due to “stress”), and then it tracks back down the axon to the original site of infection, and sheds into the environment once again. For HSV-1 the reactivations are usually seen the common and fairly harmless cold sores. That traditional view has been changing. For example, we now know that the virus reactivates far more often than was believed;3 the reactivations come in such short bursts that unless you monitor very closely (swabbing 4 times a day, in the study in question) you’ll miss most of them. And they’re not associated with any lesions, usually. Another change in the traditional view is that, at least for some, and perhaps most or even all of the infected neurons, the virus doesn’t really shut down protein expression to zero. Levels are drastically reduced, but T cells are incredibly sensitive, and it is now clear that T cells do in fact detect HSV-infected neurons in the ganglia. I posted about this research HERE, noting the evidence that infected neurons are often surrounded by HSV-specific T cells. So if cytotoxic T lymphocytes are constantly detecting target infected neurons, they should be killing the neurons, right? That’s what “cytotoxic” implies. But clearly that’s not the case. Most of you, sitting reading this now (if anyone has in fact made it this far) have lots of “latent” herpes simplex in your trigeminal ganglia — the vast majority of people are infected. And yet your trigeminal ganglia are not slowly disintegrating under the assault of lytic T cells. The virus will still be there when you’re 70 years old, and your ganglia will still be intact (at least, as far as this is concerned; I make no further promises or guarantees). So what Hendricks’ group has shown is that, yes, CD8 T cells do recognize HSV-infected neurons (this was already known). And the T cells suppress the virus, preventing it from reactivating; this was already known too. What’s new is that they showed that the T cells need perforin and granzyme B to prevent the reactivation, even though the neurons are not killed! They went on to show that granzyme B (which is a protease, that’s how it causes apoptosis) chops up a critical viral protein, blocking the virus from further protein production. 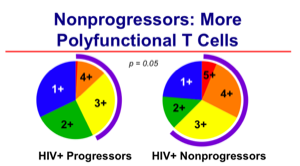 So lytic substances can protect without actually lysing — a new function for CD8 T cells. It’s not clear to me exactly how this works. For one thing, they also showed that a little later in infection there are other factors that suppress the virus (multifunctional! ), and suggested that interferon might play this role. Still, it’s a very cool finding, and reminds us that viruses and immunity are both more complex than we know, and put together are complex cubed. Note that this does not mean that perforin and granzyme B are not cytotoxic proteins! That’s very clearly their major function.4 What Hendricks’ work does show is that cytotoxicity is not their ONLY function.